It is often considered bad practice to focus too heavily on the relationship between the title of a work and its content. It’s too easy an entry into criticism or interpretation, they say, an obvious foray – what ‘meaning’ does one lend the other? 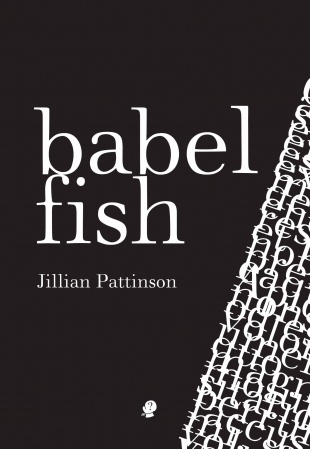 Yet Babel Fish, the title of Jillian Pattinson’s first collection of poetry, is such a perfect distillation of the work that it demands attention. to wonder at in the single cell of this simple being. With the eye of the biologist, attuned to the poetry of science and the natural world in a manner not unlike Rachel Carson, Jillian Pattinson reminds us of the interconnectedness of all things. The ‘uni’-verse is exploded, splintered into ‘multi’-verse, but through a kaleidoscopic lens of what already exists – established disciplines and discourses. Keats said Newton destroyed the beauty of the rainbow by explaining where the colours came from, but Dawkins argues that knowing where the colours come from enhances the beauty of the rainbow. Babel Fish appears to share this attitude to science and enquiry, locating beauty in origins, causation and explanation. Pattinson explores the celestial and the terrestrial, the corporeal and the ethereal in a way that seems to say I have not combined these polar opposites, but rather discovered them already united, one and the same, disgruntled at their separation. Indeed, what is striking is how disarming Pattinson’s collection is. As a self-declared ‘avid reader’ I was embarrassed by my own surprise at the interdisciplinary nature of Babel Fish. Not only does the reader encounter different fields, modes of enquiry, and poetic forms, but ever-expanding subsets coexisting harmoniously. On the whole, disciplinary boundaries are becoming more porous, more permeable, yet it is testament to the tunnel vision that has so characterised ‘uni’-versities that the idea of a decompartmentalised and integrated world is so novel. Babel Fish says that what we see when we truly look is an inextricable ecology of life. ‘The Still Point’ speaks of the folded quality of a moment in time, oriented by the narratives within which it is encased. This notion is reminiscent of Nabokov’s predilection for the substance of units of time, or of Blake’s depictions of the finite and the infinite residing in the same symbol. Then there is no way. Then you are not here. into all you think you know. Dusk swells the slow pool. Her command of rhythm and repetition makes room for thoughts to echo; the patterns of imagery and phrases create sonic ripples that reflect the routines we fall into and which shape our lives. Babel Fish is an accomplished debut collection and a deserving recipient, in its manuscript form, of the 2010 Alec Bolton Prize. Charlotte Guest is the Publishing Officer at UWA Publishing, and a first class Literature Honours student from the University of Western Australia. She is also a regular reviewer for The Australia Times Theatre magazine. Her work has been previously published in a number of journals, including dotdotdash and Run Rabbit Magazine. This entry was posted in Babel Fish, Charlotte Guest, Issue 14, Jillian Pattinson, Puncher & Wattmann and tagged Australian Literature, Australian poetry, poetry, Rachel Carson by Mark Roberts. Bookmark the permalink.